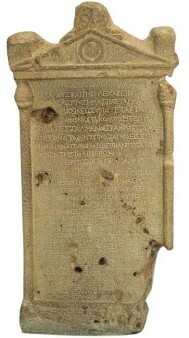 The Greek inscription discovered accidentally in Do-Khaharan, Nahavand, in 1943. A team of Iranian archaeologists has recently returned to an area within the town of Nahavand, western Iran, to search for traces of the Laodicea Temple. They believe that the ancient Greek temple is buried beneath many residential units built by the locals on the site over the years. “The construction of the units has caused such widespread destruction that there is little likelihood of finding signs of the temple,” team director Mehdi Rahbar told the Persian service of the Iranian Students News Agency on Sunday. He said that Ukrainian-born French archeologist Roman Ghirshman began to conduct searches in the region in 1948 to find traces of the temple, but the searches were halted after he found widespread destruction in the archaeological strata. A number of Iranian cultural officials announced in 2006 about their plan to buy a number of houses in a region in order to facilitate the excavation of the area. In June 2005, a team of Iranian archaeologists led by Rahbar began searching for the temple in Nahavand, which is located 40 kilometers southeast of Malayer in Hamedan Province. However, no details were published about the study. 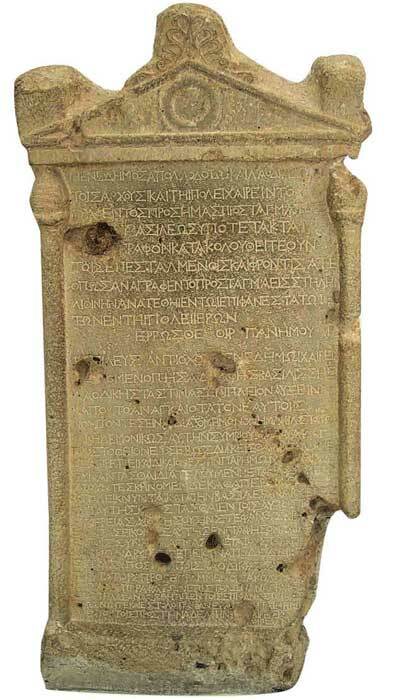 In 1943, archaeologists discovered an 85×36 centimeter ancient inscription of 30 lines written in Greek calling on the people of Nahavand to obey the laws of the government. The inscription indicated the existence of the Laodicea Temple, which had been built by the Seleucid king who ruled Asia Minor, Antiochus III the Great (223-187 BC), for his wife Queen Laodicea. Two other inscriptions as well as four bronze statuettes have been unearthed at the site, which are on display in the National Museum of Iran in Tehran. A number of capitals and bases of the temple’s columns excavated over the years are currently being used as decorations in Nahavand’s Hajian Bazaar and several other parts of the city. Antiochus was the most distinguished of the Seleucids. Having made vassal states out of Parthia in present-day northeastern Iran and Bactria (an ancient country in Central Asia), he warred successfully against the Egyptian king Ptolemy V and in 198 BC obtained possession of all of Palestine and Lebanon. He later became involved in a conflict with the Romans, who defeated him at Thermopylae in 191 BC and at Magnesia (now Manisa, Turkey) in 190 BC. As the price of peace, he was forced to surrender all his dominions west of the Taurus Mountains and to pay costly tribute. Antiochus, who early in his reign had restored the Seleucid Empire, finally forfeited its influence in the eastern Mediterranean by his failure to recognize the rising power of Rome.